Jeanie Saenz obituary. Carnes Funeral Home. 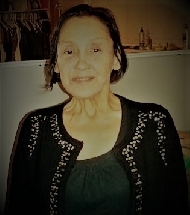 Jeanie Saenz age 61, passed away on August 11, 2018 at Clear Lake Regional Hospital. She was born in Galveston, TX; she was the daughter of Enrique Jose Saenz and Carlotta Saenz. She obtained several nursing certificates in her lifetime and loved being involved in the health care field. Though she had many different occupations her care for people was her most rewarding. She will always be remembered for her love of her family as well as her love for her friends. She always had a smile and laugh for everyone she met. She is preceded by her parents Enrique Jose Saenz and Carlotta Saenz, her sisters Elvira Saenz, Erma Saenz, Rebecca Triejo, and her brother Earnest Saenz and brother in-law Emilio Alaniz. She is survived by her two sons, the oldest Daniel Able Porras and his wife Constance Porras and youngest John Albert Porras, as well as her Grandchildren Jessica Rae Porras, Michelle Oliver, Jonathan Jacob Porras and Alyssa Paige Porras. She is also survived by her sisters Consuelo Alaniz, Carlotta Martinez Saenz, Clemencia Martinez Saenz and Maria Guadalupe Saenz, as well as her brothers Esteban Saenz and Juanito Saenz. The memorial service will be held on August 16, 2018 at Carnes Funeral Home, 3100 Gulf Freeway, Texas City, TX 77591. The visitation will be held from 5:00 pm to 7:00 pm and will be followed immediately by the service. There will be a get together in the Carnes reception area directly after the service. Special Thank You for all the thoughts and Prayers!